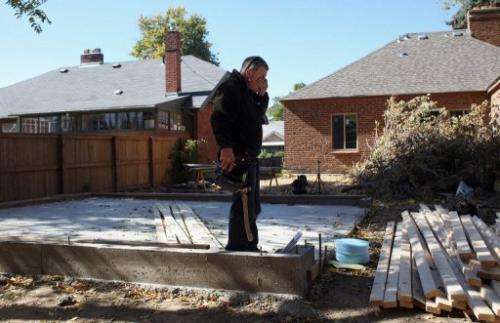 John Holzhauer renovates a home on October 19, 2011 in Denver, Colorado. WikiHouse is putting a new spin on old-time barn-raising with a free online resource that lets people put homes together the same way they might a giant jigsaw puzzle. WikiHouse.cc was designed as an open-source construction kit that lets people create and share home designs and then "print" pieces using machines available for as little as a few thousand dollars. "Two or three people working together can build a small house in about a day," said Alastair Parvin, a British architect sharing his work at WikiHouse at a TED gathering on Thursday in California. "People continually get confused between construction work and having fun." "It is kind of like making a big jigsaw puzzle," Parvin told AFP. "It is basically magic as far as I'm concerned." A growing "makers movement" coupled with increasingly affordable technology such as 3D printers and CNC machines is letting consumers become creators of goods they desire, according to Parvin. "How awesome would it be if we had a kind of Wikipedia for stuff?" he asked rhetorically. "How much would that change the rules? I think technology is on our side." He sees the great design project of this century as the "democratization of production." "Slums are being built anyway," Parvin said. "If people are going to build things for themselves, wouldn't it be cool if what they make is not rubbish?" "We could do it," Parvin said. "We are at a point where it is not innovative; it is just that architecture is behind the game." Another Revolution that will cause massive unemployment. Excellent. It is time to reduce slavery to a 4 day work week. Actually it will create jobs if it catches on. Though I agree that a shorter work week would improve the world. It would just require a lot of regulations. I'm still trying to figure out what exactly is pioneering about a stripped-down AutoCAD and a CNC machine. For the amount of the money you'd pay for the CNC, you could buy the materials to build a (yes, small) house the old-fashioned way with pre-measured and pre-cut parts from Home Depot. Interlocking chunks of pressboard, OSB, or some other sheet wood is a really disturbingly low-quality method of building an entire house, and neither this article nor the Web site even get into materials like ducts and conduit, facades, trim, carpet and so forth.